According to Murphy’s Law, “Anything that can go wrong, will go wrong.” And Diary of a Wimpy Kid: The Long Haul provides cinematic support for that pessimistic principle. 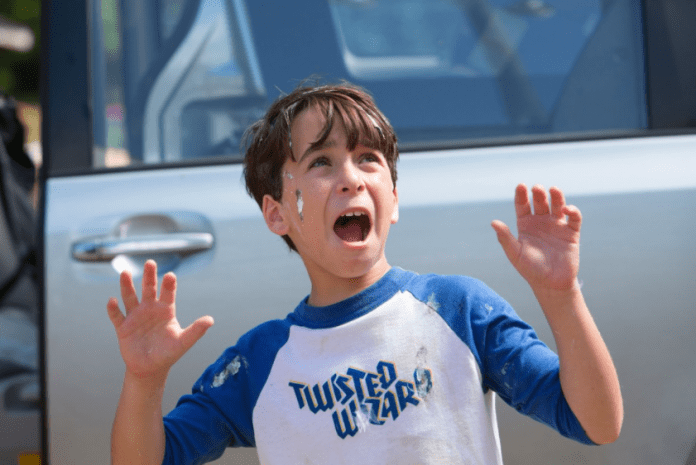 For, this kitchen sink comedy relies on the domino effect to exacerbate the ever-mounting misfortunes visited upon the beleaguered Heffley family over the course of one disastrous, summer road trip. The film is the fourth in the series based on Jeff Kinney’s illustrated children’s novels. It was directed by David Bowers who also made Wimpy Kid 2 and 3. It’s understandable that the youngsters from the original might have aged out of their roles, though it’s a bit of a surprise that the movie features an entirely new cast, starting with Jason Drucker as the title character, Wimpy Greg Heffley. Alicia Silverstone and Tom Everett Scott play his parents, Susan and Frank, while Charlie Wright and Dylan Walters assume the roles of his older and younger brothers, Rodrick and Manny, respectively. The premise of Wimpy Kid 4 revolves around a cross-country family outing to attend grandma’s 90th birthday party. The catch is that Susan envisions the drive as an opportunity to share quality time, so she collects everybody’s cell phone devices before departing. This frustrates her fidgety brood who prove clueless without electronic devices. So Rodrick calls her “the worst mom ever” and sticks a “kidnapped” sign in the rear window which leads to their being pulled over by the police. Subsequent eventful stops range from an overnight stay in a motel with rats in the pool to a visit to a country fair where Manny wins a live piglet as a prize. The humor flowing from the escalating insanity is mostly of the bodily function variety: with farts, feces, burps and barfing being real crowd-pleasers. Every skit is designed to keep the target audience of tykes and tots in stitches, with only occasional asides for adults, such as the inspired homage to Psycho’s legendary shower scene. Altogether, a delightfully-mindless diversion for the pre-teen demographic!